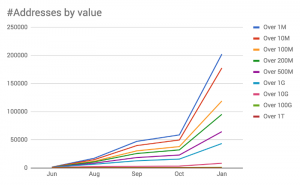 The data used, unless otherwise stated, excludes the top 5 addresses, which are believed to be directly connected to the Foundation, holding rescued funds for reclaims, for example. In my previous article, I was speculating that we would reach 100.000 by Christmas 2017. 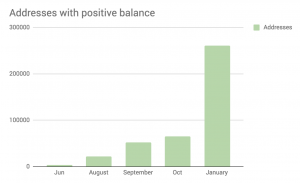 One month later we have 260.629 addresses with positive balance! That’s almost 400% growth! Does that look like an exponential growth? We cannot say for sure that this number also reflects the total number of seeds/investors, since each seed can have multiple addresses with positive balance and a user can have multiple seeds. However, it is still a good indicator. 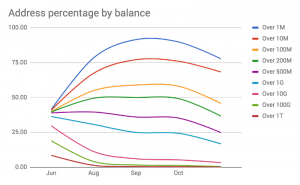 If we assume that the average user uses the Tangle in the same, predictable way as before, the growth in the numbers would be somewhat linear. In this case, it is parabolic. 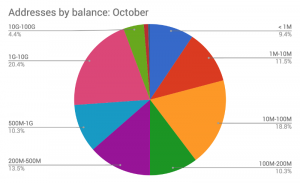 The reason for this is obviously the increased interest in IOTA during the past few months, given the announced projects, collaborations, partnerships, prospects and industry leaders joining the IOTA Foundation. 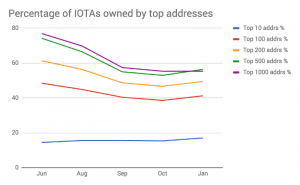 The reason is that addresses with balances of under 1M IOTAs are growing much, much faster than the rest. Actually, they sum up almost 25% of all addresses. 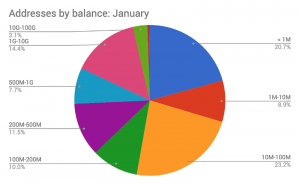 This shows usage beyond mere investor’s holding, but actual projects working and testing micro-transactions. I am claiming this from personal experience. 🙂 We need those projects, we need usage – not just holders and opportunists, but real-world solutions. These addresses’ growth is sweeter than honey! The amount of addresses with balances under 100M shifted from about 50% to almost tho thirds of all addresses! Given the pace at which IOTA’s ecosystem is growing and the huge interest from industry leaders it is receiving, it is obvious that those who really know the value of the technology will continue to acquire IOTA, especially in the currently flat and depressed crypto market. When people succumb to the madman’s screams, the price and value diverge even more. This is a perfect opportunity for the cold-blooded and the patient. While generally, the higher addresses from top-1000 gained in value, the top 4 addresses actually decreased in size by as much as 47%. This might just be a split to another seed or transfer to a bigger investor (like the Bosch’s Venture Capital). For me, the reason is quite obvious: the newly incorporated Foundation can legally use all those funds at last to promote the ecosystem and further development of the Tangle. On the other side, one of the addresses was holding the rescued funds, that are being returned during the reclaim process. Given the amount of real-world projects and cooperations that are being worked on right now, I definitely see the exponential growth to continue during 2018. 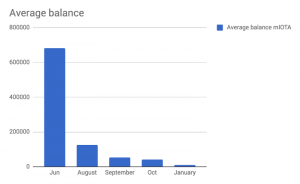 It is almost certain that the Tangle will have over a million addresses with positive balance before summer 2018. The addresses with under 1M IOTA’s will be leading this growth, which is excellent news from adaptation’s point of view. I also see number of bigger “whales” joining the vibe and new +1T addresses appearing, which is also good news — a few strong hands and believers in form of bigger industrial/institutional investors would solidify the IOTA project even further. As for Deviota, we 100% believe in IOTA and it’s importance for the world. We will continue our project(s) with the next milestone to be announced very soon. Stay tuned!